This month, U.S. European Command will celebrate 45 years on Patch Barracks. After French President Charles De Gaulle demanded the removal of all U.S. and NATO headquarters and forces from French soil in 1966, 7th Army departed Patch Barracks and moved to Heidelberg, allowing EUCOM headquarters to establish Patch Barracks as its home on March 15, 1967. Rudi Detlefsen, a U.S. Army Garrison Stuttgart local national employee since 1966, saw it all. Born in Kiel, in northern Germany, he had emigrated to Australia as a young man. Detlefsen returned to Germany for a visit in 1966 and found himself in Stuttgart, where he met his future wife, Irmgard. He decided to stay. Detlefsen’s career with the U.S. Forces began following a conversation with a few American Soldiers while on Nellingen Barracks, an open post at the time. “After talking to them for a while, they asked me if I would be interested in working for the Americans here in Stuttgart,” Detlefsen said. Only a few weeks later, Detlefsen reported to duty at the Stuttgart Installation Division, known today as Directorate of Public Works, as a dispatcher in the motor pool on Robinson Barracks. One of Detlefsen’s first missions as a local national employee was to support EUCOM’s move from France to Patch Barracks. In a 2007 article by Dr. James McNaughton, former U.S. European Command historian, EUCOM and its service components planned and executed the movement of numerous units and headquarters, that included 70,000 people (including family members) and 813,000 tons of materiel in less than 12 months. The operation was named “FRELOC,” short for fast relocation. 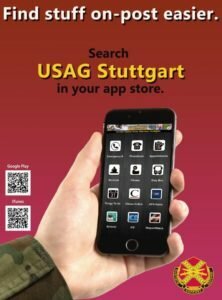 From the late 1960s until the early 1990s, the Stuttgart military community was spread out over 15 major military installations, in addition to several smaller facilities in the greater Stuttgart area, according to www.usarmygermany.com, a website designed as a resource center pertaining to the U.S. Army’s presence in Germany. During peak times, the community counted between 35,000 and 40,000 Americans, depending on the source. In the late 1960s, the military community in Stuttgart (U.S. Army Area Command) was part of the North Württemberg District and home to the VII Corps headquarters and the U.S. European Command. “We had a district commander. However, my division was part of, and reported to, the District Engineer Command, which was headquartered in Frankfurt,” Detlefsen said.” Beside Stuttgart, the Installation Division was in charge of facilities in Schwäbisch Gmünd, Schwäbisch Hall, Heilbronn and Göppingen,” he added. Not only was the command structure different. The workforce mainly consisted of Soldiers, with local nationals making up the vast majority of the civilian labor force. “The ‘Greens’ were Soldiers — from generals down to privates — and on the other side were the local nationals. Within a few months into his employment, Detlfesen took over the maintenance and repair branch, including all projects that had to do with road construction, gardening and housing areas. He was responsible for the Nellingen, Kelley, Patch, and Robinson Barracks, several military installations in Ludwigsburg, Panzer Kaserne and the Clay House, the residence of the senior U.S. military officer in Stuttgart. Detlefsen has had the opportunity to meet every general that lived in the Clay house during his career. Back then, some 1,200 people worked for the Installation Division. Today, DPW consists of 150 employees. Detlefsen recalled that the U.S. Forces were part of everyday life in the greater Stuttgart area during those days. He even remembers when tanks used to drive around downtown Stuttgart. Another memory that he likes to share is about sheep on Robinson Barracks. Starting in the 1970s, Detlefsen hired shepherds to bring in sheep to graze on the installation to save grass-cutting costs. “The only problem was that many Americans had dogs that sometimes made the sheep run away. They escaped all over [Zuffenhausen] and had to be caught several times,” Detlefsen said. The sheep were on Robinson Barracks until 2003, when the area was fenced in. Despite any differences, Detlefsen recalled German-American relationships as being “very good.” Many times, the troops were invited to German homes for the holidays, and most military installations were open to their German neighbors. In his 46 years of service to the U.S. military in Stuttgart, Detlefsen experienced politically moving times. The Cold War continued to smolder, the Red Army Faction, a German left-wing terror group critical towards U.S. politics, was a growing threat, and the Vietnam War aroused a passionate anti-American sentiment. The Stuttgart military community underwent several transformations during these tumultuous days. Detlefsen witnessed one of the most significant changes during Operations Desert Shield and Desert Storm as he supported the deployment of VII Corps. “It was short notice, and people here worked day and night to complete the mission,” Detlefsen said. An operation of this magnitude required intense planning, coordination and procurement. Since the German market didn’t have all the materials needed for transporting tanks and other equipment by rail, cable and supplies had to be ordered from all over the world, according to Detlefsen. Werner Meschenmoser, a colleague of Detlefsen, was also involved in supporting the VII Corps deployment. He recalled the entire military community being heavily engaged in planning and executing the corps’ movement and its 35,000 Soldiers in less than two months. It was not business as usual. “During that time a person’s word replaced piles of red tape,” Meschenmoser said. Shortly after the corps left, it was obvious that the troops would not return to Stuttgart, according to Detlefsen. VII Corps, headquartered in Stuttgart on Kelley Barracks since 1951, was officially inactivated at Fort McPherson, Ga., in April 1992. The farewell ceremony was held March 18, 1992, in downtown Stuttgart. The event was attended by nearly 400 U.S., German, Canadian and French Soldiers, as well as local and international dignitaries. With the fall of the Berlin Wall in 1989, the Cold War was over, and the mission of the U.S. Forces changed. However, Germany still was considered a strategic location to support U.S. interests. Many installations subsequently closed, and land was returned to the host nation. The Stuttgart military community drew down to what it is now. On Kelley Barracks, a piece of the Berlin Wall, as well as a Russian tank from Iraq and a Sherman tank from World War II reflect this history. Many times, Detlefsen was in the middle of it. In 1993, he saw the Russian tank being delivered to Kelley Barracks from Iraq. He also helped to organize the transportation of the Berlin Wall piece to Kelley Barracks. Throughout his career, Detlefsen said that he had to be flexible and adjust to changes within the military community. However, he never had the desire to work for any organization other than the U.S. Army. “The Army doesn’t ask you for too much; they’re just asking you to do your job, which isn’t impossible,” he said. This September, Detlefsen will retire with 46 years of service. “Rudi Detlefsen is one of our best guys. You can always depend on him to get the job done,” said Carl Pritchard, DPW director. Sources: U.S. Army in Germany website (www.usarmygermany.com). EUCOM archives: “Forty years ago: Stuttgart gets a new headquarters,” March 16, 2007. “Post once home to German air regiment, U.S. Army VII Corps headquarters,” Stuttgart Citizen, July 13, 2004.